The message isn’t long: five staccato paragraphs squeezed onto one typewritten page. I haven’t found a copy of the memo posted on the Defense Department website, but it seems authentic, and credible military news organizations such as the U.S. Naval Institute have posted the full text online. Never forget, our willingness to take the Oath of Office and to accept the associated responsibilities means that even citizens who have never met us trust us to do the right thing, never abusing our position or looking the other way when we see something wrong. Try busting out language like that in your next meeting with the audit committee. Everyone will believe you committed the complete works of Winston Churchill to memory since last quarter. Above all, I like how Mattis frames the idea of training: as practicing ethical conduct all the time, to prepare us for ethical conduct when the really difficult situations arise and put our morals to the test. Mattis is right. Drilling employees on anti-bribery policy is one thing; inculcating ethical business practices all the time, so employees will have the fortitude to refrain from bribery even when the SVP of sales leans on them at the end of the quarter—that’s quite another. Online tutorials don’t prepare you for that. Putting your ethics into practice in 1,000 small ways every day: that prepares you. Perhaps if Uber’s leadership had absorbed that point more deeply, Uber wouldn’t be where it is today. I also admire Mattis’ point about upholding the trust that others place in the organization. We don’t talk about trust in that way—as something precious, something others give to your organization, that employees must honor and preserve—often enough. But the truth is, investors trust companies with their money. Customers trust companies for the prices you quote them and the products you deliver. Employees trust executives to treat them fairly, and as people with value. Executives trust employees to act in the best interests of the company. All the time, in all sorts of ways, one party has relatively little power compared to another, and they engage in a relationship anyway. One party leaves itself vulnerable to another. We trust that other party not to strike the vulnerability. An ethical person, and an ethical organization, is always aware of the trust that others place in it. That’s one of the most important core values of all. As noble as Mattis’ memo about ethics might be, we still don’t know why he distributed it—why now, on an otherwise unremarkable Aug. 4? Thankfully, of course, several theories are floating around the Internet. 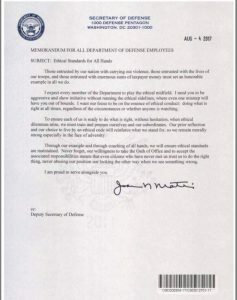 Some people believe Mattis was telegraphing a message that staff should still respect and work with transgender employees—in case anyone has ideas to embrace President Trump’s July 26 proclamation banning transgender people from serving in the military a bit too enthusiastically. Other military leaders have already begun dismissing the president’s directive. That says terrible things about the sort of commander-in-chief that Trump is, but the theory is plausible. More conspiracy-minded voices believe Mattis was warning DoD employees against obeying any illegal orders that Trump might soon issue, on Twitter or otherwise. One can’t dismiss that idea either, especially since Congress just departed for August recess. If Trump wanted to try something crazy (firing attorney general Jeff Sessions and special counsel Robert Mueller, for example), now would be a natural time for him to do so. I prefer more prosaic conspiracy theories. Mueller has convened a grand jury to keep pressing the investigation into possible collusion between the Trump campaign and the Russian government. Subpoenas are flying. Document requests have been sent. One target of the investigation seems to be erstwhile national security adviser Michael Flynn, who served in the Army for 33 years until he was forced out in 2014. Then he began his second career shilling for Russia and Turkey. My guess: people in the DoD today either are on Mueller’s witness list, or have documents in their files that Mueller wants to read. And Mattis is reminding them that even in bizarre and difficult times (which these times most certainly are), they need to do the right thing.